Despite being the holder of 15 World Series of Poker bracelets, Phil Hellmuth is the Roger Dangerfield of Poker, meaning he gets little to no respect from many in the poker community. Hellmuth takes the criticism in stride and continues to win despite the game being very different than it was when he first start in the 1980s. 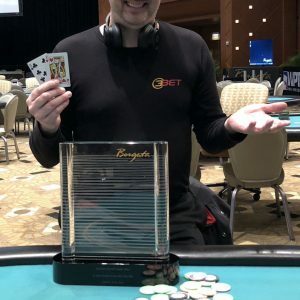 Hellmuth continued to prove he has game on Saturday after he took down the $1,500 Heads-Up NL Hold’em event at the Borgata Winter Poker Open. It was the first win for Hellmuth since taking down his fifteen WSOP bracelet last summer. The $1,500 Heads-Up NL Event at the Borgata Winter Poker Open kicked off on Saturday and drew a solid field of 64 players. The BWPO draws a solid crowd annually and many top pros make the trek to Atlantic City. This field was particularly tough and included well-known players such as Olivier Busquet, Athanasios Polychronopoulos, Joe McKeehen, and Anthony Zinno. The tournament required Hellmuth to navigate his way through five heads-up rounds, and while he didn’t take on the likes of Busquet or Zinno, he still had some stiff competition. He knocked out Wenhao Ying in Round One and then took out a tough Tim Reilly in Round 2. Next, Hellmuth had to battle hard to make it out of Round 3. He was down to 4,000 chips at one point against Travis Greenawaltt and managed to come all the way back to win the round. Hellmuth ultimately battled against Joe Cappello in the finals and it turned out to be a marathon affair. Capello had an interesting path to the final and defeated Alex Rocha and Olivier Busquet along the way. However, in the end, he was unable to take down the 15-time WSOP bracelet. In the final hand, Cappello was all-in with Q-7 and Hellmuth called with K-9. The board blanked both players and Hellmuth took down the title. The poker community as a whole has mixed opinions about Phil Hellmuth, but one that you hear often is that the game has largely passed him by. Of course, that seems silly considering that Hellmuth has found a way to win on the largest stages of the world and in all eras of the game. Last summer, Hellmuth took down his 15th WSOP bracelet and put the world on notice that he was still a force to contend with in the poker world. Hellmuth has largely rejected much of what’s considered winning poker strategy nowadays, including things like GTO and plays a game that relies on his reads, his instincts, and well time aggressive play. What may be most impressive about Hellmuth is that he finds a way to win in different games and variants throughout his career. I remember back in 2008 making bets against Hellmuth in non-Hold’em games. Then he turns around a wins a pair of Razz bracelets. Amazingly, Saturday’s win was the first time that Hellmuth has taken down an open field Heads-Up tournament in his career. He took down a Poker After Dark Heads Up tournament in 2008 and was runner-up to Mike Matusow in the 2013 NBC National Heads-Up Championship.